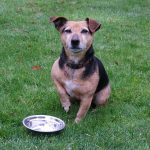 We give a combination of cooked food and dog biscuits for our pet dogs. There was a time when my schedule got a little busy and I did not have time to cook food for them- and resorted to giving them only dog biscuits. However about a month later, I reverted again to cooking their main meals. Even though I am not a good cook, at least my dogs love my cooking 😛 . They do look a little miserable when they are being made to eat dog biscuits for dinner after a few consecutive days. We are not from a rich family hence we are not able to afford the expensive dog biscuits for our dogs. There are more affordable brands but they are still more expensive compared to buying food and cooking myself for them. Once you identify a system to cook all in a batch, it is not really that hard. As my doggies do not like dog biscuits, they would display a little diva behavior. I actually have to sit with them or else they would get distracted at the slightest people passing by. They would move off from their plates and go off to bark at something. But if it is the cooked dog food, they would be focused on eating it and I can go away to do other things like washing up. bones- especially fish bones and those bones with sharp edges that can pierce the digestive tracks or choke your beloved pets. When I was younger and did not know better, we used to give leftover bones and dishes to our dogs. Our dogs used to scratch themselves often dropping furballs all over the place. One of them developed skin problems. They seemed to get ticks more often which can drive everyone crazy. After I know better, I become strict in the type of food that I would give my pets. They contained none or very very minimal amount of salt. Most of the time, their food consists of meat with rice and sometimes vegetables. Usually it would be a day that I know I am free to work at home. I go a regular meat seller to get my meat. I would wash and then cook the meat. I leave the meat in the covered work for a few hours to cool down. After that, I would cut up the meat into small cubes and place them in a few plastic bags (I reuse from the bread plastic bags that I keep aside). Each plastic bag would contain enough meat to last me for 3 to 4 days of my dogs’ dinner. In total, each time I cook a batch, it would last me about 3 weeks. I will keep about one bag down the fridge while the others in the freezer (to prevent the meat getting spoiled) – I ensure I have enough freezer space when I buy the food. All the bags are tied with strings. At first, I do not look forward to the task. But I figured that I would use the cutting time to listen to educational YouTube videos. As a blogger who worked from home, these videos have helped to keep me motivated. Note: I also listen to YouTube videos while doing tasks like decluttering and ironing, so much so that I no longer mind doing these tasks. In one bag (size of a bread bag), there are enough portions for a few days. I cook the meat with rice as we eat rice everyday in our home. First, I would heat the wok with water (enough to cover everything a little), then add rice and followed by the meat. I cook about 15 minutes, stirring the food until the water dries up. Then leave it to cool and feed to my dogs about an hour or two later. Usually we would use the leftover rice (refrigerated) to cook. I would not use rice that are more than 4 days (usually it would be just within 2 days) as the rice may grow stale or have too much bacteria. My meat seller would buy cheaper rice to mix with the meat to cook for her dogs. But I find it too much of a hassle and there is not much difference in pricing. So I usually cook a little extra rice to use to cook dog food later. Also, I always use a clean spoon to scoop my rice to avoid contamination. Cooked rice gets spoiled quickly when you dip your gravy laden spoon into it. I keep my meat and rice separately stored in my fridge. I only mix them together in the wok when I wanted to cook for my dogs. Some ladies I know would cook like a week of food in advance but I find that it food may spoil quickly when cooked together. Sometimes when there are leftover vegetables, I would put them in together with the food. If it is from a vegetable dish, I would soak it for a while to remove the salt and flavorings. Once I created a system in place, it is very easy to maintain it. A bag stored in the fridge would last about 3 or 4 days. When I cook the last portion in the bag, I would then immediately take out another frozen bag from the freezer to keep at the place. It would require about a day in the fridge to defrost the meat. When I am taking out the last bag, I would make a mental note that the supply is low and schedule the visit to the market within the next few days. However if I am really busy during the week, my doggies would need to survive on dog biscuits. I also practice the same with dog biscuits- the moment I see the supply running low I would make a note to buy it the next time i am at the store. It is cheaper when I buy the meat parts (like liver and gizzard, etc), cook and cut it myself. However if you wish to save time, you can buy minced meat and then put them in smaller containers- enough for about 2 days ration. Keep one container in the fridge (not frozen) and the rest in the freezer. Then just heat up water on your work, at the minced meat and rice. The water is enough to just cover everything a little. Continue to stir till the taste comes out to the water and blend with the rice. Cooking for your pets may seemed to be a lot of work. But for me, it has been worth it seeing my pets happy and looking forward to their dinner (I feed them also once in the morning with dog biscuits). There is something wonderful and therapeutic when you see the happy smiles and wagging tails as you bring the food to them. Also, once I established a routine – I would start my cooking about 5pm each day… it becomes an automatic habit.